Roanoke Times, 7-2-12, Pg 1: An adventure in keeping food in the fridge from spoiling, trying to sleep, avoiding heat stroke, and wishing hard for the electricity to come back on. Is this story: Short-term storm damage – or – long term Obama energy policy! If this is a short-term storm damage story then not to worry, the Power Companies will get the service back very soon and most folks will be able to “tough it out”. On the other hand if this is the result of Obama’s energy policy – you are in big dodo! Obama’ shut-down of current utility power development and production before new sources of affordable and reliable energy systems are in place will result in the widespread and very harsh outcomes described in this article. There is no indication anywhere that the Obama Energy Policy is planned to accommodate our current energy requirements no less our continued population growth of 2 million people per year (two cities the size of Boston every year!). Failure to do so will cripple our people, our industries and our government thereby making our current financial problems pale in comparison to the inability to support our growing population and energy requirements. 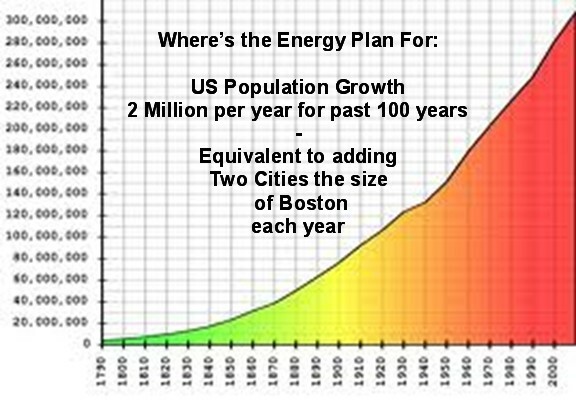 When will Obama and associates stop hyping wind and solar alternatives and show us the plan to support the real energy needs of this country and our people?